I just wanted to update you all on how Danny (a.k.a Pip) is doing. He has really come a long way! After talking with his vet and talking to other people it looks like Danny was about 9 months old when we got him. Give or take. I had to get a trainer to help with him walking on leash and other things young dogs need. I got a trainer from DogEvolve and we went to classes and did private lessons too. Danny and I spend each day at the enclosed park. We are there for at least 3 hours a day. Sometimes we go to the beach at Crissy Field. The best part is that Danny has a lot of dog friends to play with at the park and has many play dates in his yard which he loves. After his day at the park, he likes to sit in the sun in the yard for awhile until he comes in the house and kicks the pillow off the bed or moves them to the way he likes it. He also has a lot of human friends too and get excited when they show up at the park or his house. Thank you so much for my boy! It has taken so work and some training, but he is so great and he is really a sweet boy!! 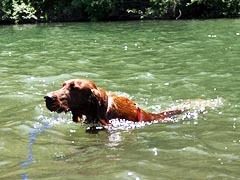 He went to the Russian River for the first time and got to swim. He isn't ready to be off leash just yet, but has come a long way not to chase bikes at the fence in the park. He comes when I ask him to. Thank you all again for your hard work. Because of it, you all have made not only numerous dogs happy, but especially one Irish Setter very happy like his new family.